How to Get from Lisbon Airport to Sintra? Visiting Sintra soon? Sintra is one of the top destinations in Portugal. Upon arrival on Lisbon airport you will need a transport to travel the 30km to Sintra. First time visitors tend to use public transportation: you will have to catch a bus or a taxi to Oriente (Lisbon central station). To avoid wasting a couple of hours in multiple transports to Sintra, your best option is to book a private transfer to Sintra. We provide private transportation directly from Lisbon airport to Sintra in approximately 30 min for a reasonable price. We will be waiting for you at the arrivals hall. Select Sintra as your transfer destination area and provide us with flight details, Sintra accommodation address and contact. We automatically process your request for transport availability to Sintra and send a booking voucher with your transfer confirmation in a matter of seconds. At Lisbon Airport arrivals terminal a friendly driver will be waiting for you next to a placard with our website logo. For the return transfer we will pick you up from the same address in Sintra. And remember, you can always pay later to the driver for both your arrival and return Sintra transfer. How far is Sintra from Lisbon Airport? How much will it cost? How long? The travel distance between Lisbon Airport and Sintra is 30Km and transfer time takes approximatly 30mins under normal traffic conditions. We guarantee a private transportation directly to your destination. Our Lisbon airport transfers to Sintra have a fixed price per vehicle not per person. This personalized service is a much affordable and mind free alternative transport to Sintra. At the arrivals hall a designated driver will meet and assist you with all the luggage and guide you to your assigned vehicle. Depending on the size of the group, the transport may vary from an executive saloon or estate car for up to 4 passengers, modern people carrier van or mini-bus up to 16 passengers or even a large bus up to 27 passengers. You will be relaxing at your Sintra resort, hotel or private villa in about 30 minutes. Enjoy Sintra! Top destination in Portugal, located at north of Lisbon, Sintra attracts thousands of visitors from all over the world every year. 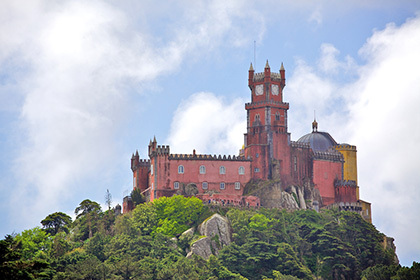 Sintra preserves the Romantic architecture from the 19th century. The town and its surroundings are dotted with royal retreats, castles and building from past centuries, some of it are private. Don’t miss the Castelo de Mouros, Pena National Palace and Sintra Nacional Palace which classify the spot as World Heritage Site by UNESCO in 1995. If you’re staying in a Sintra Hotel or other type of accommodation, you will be amazed by the quantity of history each wall of this buildings has in it. We offer high quality transportation services, directly from Lisbon airport to any resort or hotel in the Sintra area: Penha Longa Hotel Golf Resort, Pestana Sintra Golf, Quinta da Beloura Golf, Estoril-Sol International Golf Academy, Lisbon Sports Club, Belas Clube de Campo, Palacio de Seteais Hotel, etc. Pre-book now your airport taxi transfer from Lisbon airport to Sintra, check out or complete list of fares & prices and if you can’t find your destination request us for a custom quote.